When we heard there was a new online casino in town, we could’t help but smile. We’re always looking for the freshest and hottest casino, and couldn’t wait to get our play on and review this newcomer straight away. Triple Aces Casino just launched today, on the 1st of March 2018, and is operated by GT Entertainment in Malta. Due to the location it’s no surprise that they hold a license from the MGA (Malta Gaming Authority). Although brand new, the team running the show has 15 years of experience in the gaming industry. We’ve put this rookie to the test and love to share our opinion in this complete Triple Aces Casino review. When it comes to the appearance of the brand, most online casinos opt for bright and colourful. If you’re tired of all the fluorescent colours, and looking for something that your eyes can actually handle, then Triple Aces Casino is the perfect choice for you. The prodominant colour used on the website is grey. As if inviting you to play, you’ll find a proud looking Gonzo (from Gonzo’s Quest) positioned at the top of the site. Right underneath him, you’ll find 10 clickable buttons. These each take you to a certain game category, or personal pages where you can find your favourites and last played games. We always appreciate options like this, since there’s nothing more annoying than finding a game you absolutely love, only to forgot the name a few days later. As we do with every casino review, we signed up to Aces Casino and had a little fun ourselves. Let’s take you through the registration process. After you click on the “open account” button, a pop-up will appear where you’ll have to enter your details. This includes entering a username, your mobile phone number, date of birth, country, currency, gender, and a more uncommon field: a secret question. Once extremely popular, we see this option less and less nowadays. You’ll select one of the preset questions, and enter your personal answer in the field next to it. Finish of your registration by accepting the terms and conditions and clicking on the confirmation button. To welcome new players at Triple Aces, the casino gives newly registered people a warming welcome bonus. The welcome offer consists of two parts, the first part being a deposit bonus. You will receive the bonus after you have made your very first deposit, which will be doubled! The bonus is 100% the amount of your deposit, up to €111. For example, if your first deposit is €20, you will receive €20 bonus and thus have €20 to play with. If you deposit €120 , your bonus will be €111 and thus will have €231 to play with. You will also receive free spins on a videoslot. To keep a sense of mystery, the amount of free spins you’ll receive is a surprise. If you want to know how many free spins you’ll receive, simply register an account and make your first deposit. Besides the welcome bonus, Triple Aces casino offers a variety of other bonuses. Don’t forget to check out the bonus page every now and then, since there will be monthly bonuses as well as special bonuses around the holidays. Furthermore, you will be introduced to free spins promotions, and loyal and frequent players can ofcourse count on loyalty bonuses. The real big spenders can receive a personal invitation to start enjoying VIP Trip Aces Club Bonuses. We’re definitely curious to see what they have in store! Bonuses aside, there is one thing that can make or break an online casino: their game selection. Fortunately Triple Aces definitely does not lack in that department, offering games from more than 10 different vendors such as: Betsoft, ELK, Evolution Gaming, Microgaming, NetEnt, Play ‘n Go, Playson, Quickspin, Thunderkick and Yggdrasil. The games are categorized and divided into 7 categories. We’ll go through all of them. The first three categories are slot related: Videoslots, Jackpots and Slots. When selecting one of these categories the matching slot types will appear. If you’re not sure which game you want to play you can scroll through the selection of games. Don’t feel like going through hundreds of slots? You can narrow the assortment down by selecting one of the game vendors, or simply by entering a slot name in the search field. Found something you like? Save it for later by clicking on the little crown icon in the lower left corner of the game. The slot will be added to your favourites. Table game lovers can keep themselves entertained in the Table Games category. Enter the name of your favourite game and you’ll be left with a large selection of tables to choose from. If you’d rather play against real dealers than the Live Casino category is where it’s at. All live games on Triple Aces casino are offered by microgaming. Continue by clicking on the Live Casino Lobby image, and you will enter the wonderful world of live tables. The lobby offers a wide selection of games, including the obvious popular choices like roulette, blackjack and baccarat, but also Money Wheel and several kinds of poker. The tables are accessible for player will all budgets, starting as low as €0,05 per spin on the auto-roulette table, up to €10.000 per bet on the highest Baccarat table. Triple Aces Casino is one of the very few online casinos where you can play bet games. Much like in sports betting, you will bet on a certain outcome which is paired with a certain odd. We wouldn’t recommend an online casino if you wouldn’t have a bountiful choice when it comes to deposit and withdrawal methods. 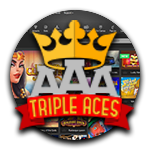 Triple Aces offers its players 7 recognized and popular deposit methods: Card payments (VISA & Mastercard), Neteller, Skrill, Bank Transfer, Astropay, Sofort and Ecopayz. The minimum deposit amount is €10, and the minimum payout amount is €20. Something worth mentioning: the minimum amount you need to deposit in order to receive the welcome bonus is €20. Payouts can be processed via NetEller, Skrill and Credit Card, and take up to 24 hours processing time. We can go on and on about this casino, but every experience is different and there’s only one way to find out how yours will be: by checking our Triple Aces yourself. Have fun!